The Spanish national football team represents Spain in international football and is controlled by the Royal Spanish Football Federation. The Spanish side are commonly referred to as La Furia Roja (The Red Fury). Spain are the current European champions, having won the UEFA European Championship in 2008. They also won the European Nations' Cup in 1964 and reached the UEFA Euro 1984 Final. Spain have qualified for the FIFA World Cup twelve times, reaching fourth place in the 1950 tournament. In July 2008, Spain rose to the top of the FIFA World Ranking for the first time in their history, becoming the sixth nation, and the first who has never won the World Cup, to top this ranking. Between November 2006 and June 2009, Spain went undefeated for a record tying 35 consecutive matches —record shared with Brazil— including a record 15-game winning streak. The Spanish Civil War and World War II prevented Spain from playing another competitive match until the 1950 World Cup. There they topped their group against England, Chile and the United States to progress to the final round. The cup was decided in a league format against the other group winners — Brazil, Uruguay, and Sweden. Spain gained only one point by drawing with eventual winners Uruguay, losing to both Brazil and Sweden, thus finishing fourth, which remains, as of 2008, their best performance in a World Cup. The team failed to qualify for another major tournament until the 1962 World Cup. Under French-Argentine coach Helenio Herrera, Spain came out of dormancy to qualify for the first European Championship in 1960. Spain beat Poland 7–2 on aggregate to progress to the quarterfinals. However, Spain forfeited its quarterfinal tie with the Soviet Union because of political circumstances between Spain's dictator Franco and the Soviets. In 1966, Spain was selected as host of the 1982 FIFA World Cup. This edition of the World Cup featured 24 teams for the first time. Expectations were high for Spain as the host nation under coach José Santamaría. 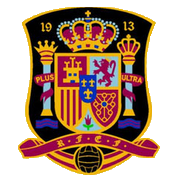 In the group stages, Spain was drawn into Group 5, in which they could only manage a 1–1 draw with Honduras in the finals' opening match, after which they had a 2–1 victory over Yugoslavia, but were defeated 1–0 by Northern Ireland. These results were enough to secure progress to the second round where they were drawn into Group B, but defeat to West Germany and a goalless draw with England meant that Spain were knocked out, and Santamaría was sacked. Spain qualified for the 1986 World Cup in Mexico having topped Group 7 with Scotland, Wales, and Iceland. Spain began the group stage by losing to Brazil 1–0, but progressed after beating Northern Ireland by 2–1 and Algeria by 3–0. Round 2 paired Spain with Denmark, who they overcame 5–1 with Emilio Butragueño scoring four goals, but in the quarterfinals a 1–1 draw with Belgium ended with Belgium winning 5–4 on penalties. For the 1990 World Cup in Italy, Spain had a new coach, Luis Suárez. Having qualified from a group consisting of Republic of Ireland, Hungary, Northern Ireland, and Malta, Spain entered the competition on a good run of form, and after reaching the knock out stages through a 0–0 draw with Uruguay and wins over South Korea (3–1) and Belgium (2–1), fell to a 2–1 defeat to Yugoslavia in the second round. Javier Clemente was appointed as Spain's coach in 1992, and the qualification for the 1994 World Cup was achieved with eight wins and one loss in twelve matches. In the final tournament Spain were in Group C in which they drew with Korea Republic 2–2 and 1–1 with Germany, before qualifying for the second round with a 3–1 victory over Bolivia. Spain continued through the second round with a 3-0 victory over Switzerland, but their tournament ended with a 2–1 defeat to Italy in the quarter-finals. In his second World Cup as Spain's coach, Clemente led his team undefeated through their qualifying group in which Yugoslavia and Czech Republic were the other contenders. Spain qualified with fourteen other European sides in the first ever thirty-two team World Cup, but were eliminated in the first round with four points after losing to Nigeria, drawing with Paraguay, and winning just one game, against Bulgaria. The qualifying tournament for the 2002 World Cup went as expected for Spain as they topped a group consisting of Austria, Israel, Bosnia and Herzegovina, and Liechtenstein. In the finals tournament Spain won its three matches in group B, against Slovenia, Paraguay (both by 3-1), and South Africa (3-2). Spain beat Republic of Ireland on penalties in the second round, and faced co-hosts Korea Republic in the quarterfinals. Spain twice thought they had scored, but the efforts were disallowed, and Korea were successful in the penalty shootout after a 0-0 draw after a great theft of party. Spain qualified for the 2006 World Cup only after a play-off against Slovakia, as they had finished behind Serbia and Montenegro in Group 7, which also included Bosnia and Herzegovina, Belgium, Lithuania, and San Marino. In Group H of the German hosted finals, Spain won all their matches, beating Ukraine 4–0, Tunisia 3–1 and Saudi Arabia 1-0. However Spain fell 3–1 in the second round to France team, with only the consolation of a share, with Brazil, of the 2006 FIFA Fair Play Award. Spain qualified for Euro 2008 at the top of Qualifying Group F with 28 points out of a possible 36, and were seeded 12th for the finals. They won all their games in Group D: 4–1 against Russia, and 2-1 against both Sweden and defending champions Greece. Luis Aragonés left the manager's role after the Euro 2008 success, and was replaced by Vicente del Bosque. 2008 saw David Villa score 12 goals in 15 games, breaking the Spanish record of 10 goals in one year held by Raúl since 1999. On 11 February 2009, David Villa broke another Spanish record against England, as his 36th-minute goal saw him become the first Spanish player to score in six consecutive games. Spain began their 2010 FIFA World Cup qualification campaign with six successive wins, and went into the 2009 FIFA Confederations Cup as one of the favourites. By the start of the tournament, Del Bosque's had ten consecutive wins, making him the first international manager to do so from his debut, breaking Joao Saldanha's record, held since 1969, of nine consecutive wins with Brazil. Spain won all three of their matches at the group stage, the 5–0 win over New Zealand including a Fernando Torres hat-trick that is the earliest and fastest hat-trick in the tournament's history. With further wins over Iraq (1–0) and South Africa (2–0) they earned not only qualification for the semifinals, but also obtained the world record for 15 consecutive wins and tied the record of 35 consecutive unbeaten games (with Brazil). On 24 June 2009, Spain's undefeated record ended when the United States beat them 2-0 in the 2009 FIFA Confederations Cup semi-finals which sent them to the third place match. This was Spain's first defeat since 2006. Spain defeated hosts South Africa 3–2 after extra time in the 3rd-place playoff. On 9 September 2009, Spain secured their place at the 2010 World Cup finals after beating Estonia 3–0 in Mérida. They went on to record a perfect World Cup qualifying record with 10 wins out of 10 in Group 5, finishing with a 5–2 victory over Bosnia and Herzegovina on 14 October 2009.